¡Buen viaje! Level 3 is part of a comprehensive three-level program. 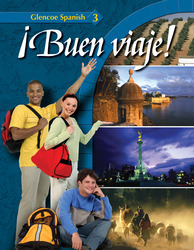 This program consists of eight chapters, each focusing on a different country or region of the Spanish-speaking world. Students have the opportunity to explore the culture and history, journalism, and literature of each location, and to participate in conversations that would take place in that location. Two review sections are included in each chapter so your students have a chance to refresh the grammar they learned in Levels 1 and 2. Self-assessment in each lesson and proficiency tasks in each chapter help students evaluate their progress. Practice and reinforce vocabulary, structure, and reading skills with Workbook and Audio Activities. Students get writing practice as well as improve listening skills by completing audio activities as they listen to the Audio CDs. Allow easy access to the Student Edition with StudentWorks™ Plus CD-ROM. Students can improve their listening and speaking skills by practicing at their own pace with the embedded audio recordings. Enable students to understand and appreciate the culture of the Spanish-speaking world and continue to strengthen their language skills with level-appropriate Lecturas culturales. Encourage students to use their growing knowledge of the Spanish language to explore other curriculum areas. Help meet the National Standards with Conexiones features. Tour the Spanish-speaking world with in-text People en Español articles. These level-appropriate, high-interest readings are about music, history, holidays, and notable Spanish-speaking people.